From the outset, with the assembling of the bespoke sustainability brief for the building, it was clear that we would be aiming to achieve exceptional standards of environmental performance. 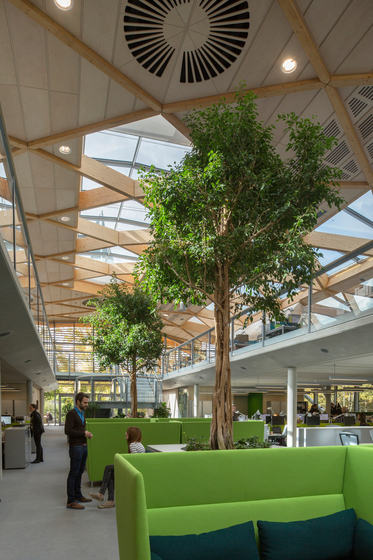 The benchmarking standard was set as BREEAM “Outstanding” and the brief was built around the principles of One Planet Living, which takes a very rounded approach to the implementation of sustainable design and construction. The building also needed to achieve BCO compliance in terms of environmental conditions and lighting, partly to satisfy the investors, partly to demonstrate what is possible in a modern integrated building. Each of these categories set up specific design challenges that were managed and tracked through Atelier Ten’s bespoke Sustainability Management Plan for the project. In practice, the team endeavoured to solve multiple briefing requirements with particular design strategies. Thus, the decision to adopt a mixed-mode approach to the ventilation for example assisted with the low carbon ambitions, is a key part of the health and well-being strategy and links to air quality and social issues as well. 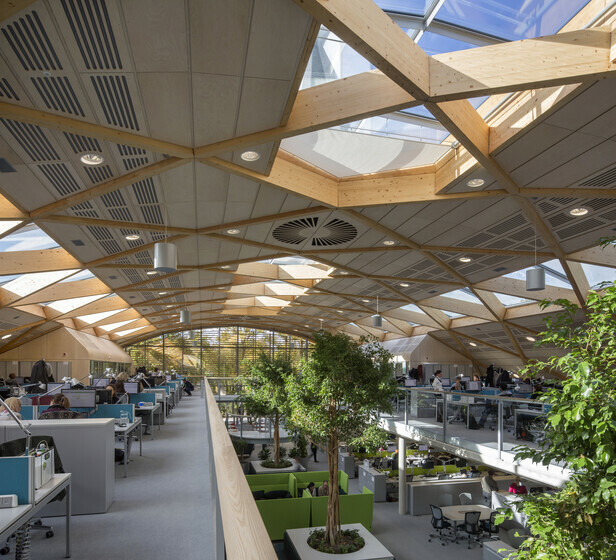 The zero carbon strategy was developed through extensive passive design studies looking at optimising daylight throughout the building while managing solar gains. Lighting demand is a key component of office energy use and the combination of side lighting and the extensive overhead skylights, with internal shades, provides a high degree of daylight autonomy with more than 90% of areas exceeding a 2% daylight factor. All of the lighting has automated daylight dimming. The installed lighting load is less than 7W/m². High-performance glass controls solar gains and reduces heat loss. The mechanical ventilation system is designed to operate in cold weather, when heat recovery is beneficial to energy demand, and in the warmest weather when a degree of pre-cooling is required. Natural ventilation is preferred for most of the year and the occupiers of the building are “advised” of what to do by small LED lights on the windows (which are then manually operated) and via the WWF intranet system at their desktops. The roof cowls are designed to rotate away from the wind. The fresh air for the building is drawn through six 60m long earth ducts that are buried beneath the surface of the car park. These provide a pre-warming effect in winter and a pre-cooling effect to the air in summer. The earth ducts can provide the vast majority of the cooling requirement in summer. Fresh air is delivered to the office space through floor voids via a displacement system. The mezzanine floor is exposed in-situ concrete and the thermal mass is activated using a mechanical night cooling strategy; the upper floor has the lightweight timber roof but this has been designed to incorporate a phase change material (Energain) behind the timber panels which, when managed properly, gives a thermal mass equivalent to 5-7cm of concrete as a diurnal heat store. A relatively small borehole field of twenty 100m long closed loop boreholes meets the heating and cooling need via a pair of heat pumps. The heat pumps also provide the cooling to the WWF computer servers and this energy is recycled to provide heating in winter. 100kWp solar PV array on the roof of the building provides a source of renewable energy and the building is connected to Woking Borough Council’s Green Electricity grid. 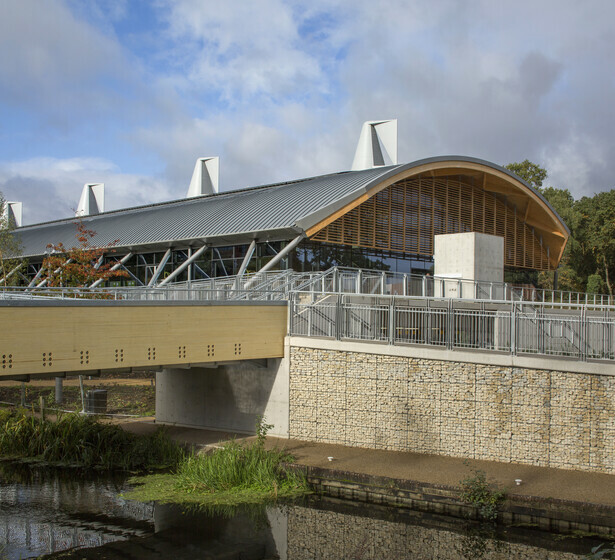 The building also includes extensive rainwater harvesting, grey water collection and treatment, a biodiverse landscape including a small wetland adjacent to the canal and a significant amount of feedback about what the building is doing, through the Jason Bruges installation in the Living Planet Centre.